Massively outclassed in the end by Novak, despite the good start. I feel for Murray, those first two sets were incredibly close but Djokovic seemed to have another gear. he's getting better all the time. did everyone see state of his feet? surprised he can even walk! they was like ravaged pieces of meat! Part and parcel of the tennis world...I bet every players feet are like that! Was a terrific performance from Novak in the end...he just kept hitting the lines every bloomin' time! Gotta give him credit here, world number 1 for a reason. When Murray was on top Djokovic managed to hang on but as soon as Djokovic started playing better he just blew Murray away. With Federer on the way out it's hard to know who could take out Djokovic in the run to a final because I think he'd beat Murray 9 times out of 10 unfortunately. There's not much between them but not much is more than enough to win. I know Murray has strength and endurance but I'm surprised more players just don't try to physically kill him. Make him chase balls around like a headless chicken he's bound to hurt something after a while. As Pigeon says there's very few that can live with him at the moment, let alone dictate the play to him and he met one of that very select group in the final but for most of the first two sets looked the better player. The standard in the first two sets was unbelievably high but particularly from Murray who was winning something like 80% of his first serves in the first set while Djokovic was winning 68% - that's nothing to be sniffed at as 68% is the sort of form that often wins a set. Well done to Djokovic, he ran out a deserved winner in the end. There were a fair few points where you could say "what if..." but there's no shame in losing to someone who has to rank as an all time great. Two of the most returningist (it's a new word ok ) players in the game means that it was a very punishing match for both of them although I rather suspect it's easier to look fresher when you've just won. The margins aren't huge at this level but hopefully the next one will be Murray's. Well done Novak, glad he won in the end. Deserved to win it as he was by far the best player in the tournament. Next year lets see if the draw can give Murray vs Ferrer in one semi and Novak vs Federer in the other a day later - and lets see if the final is still the same result, thats the only way to be sure. Well done Novak, he took his chances (especially later in the match) when Andy couldnt earlier on (in 2nd set). This year the same dates. Just saw the end of the Federer match. Tsitsipas's serves looked really good, his points came easy while Federer needed to fight a lot harder for his. 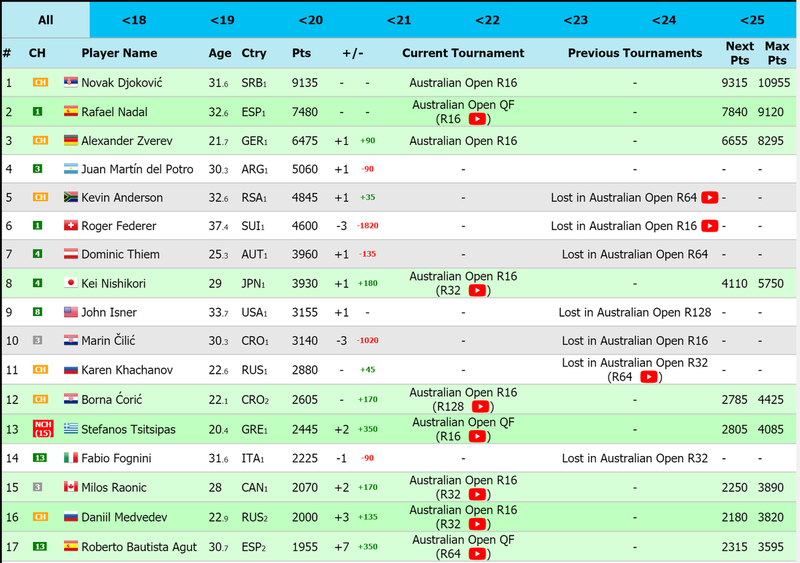 Just noticed Agut's made the quarters after beating Cilic. All things considered, that makes Murray's performance against him even better. Kitova vs Osaka final. A win win either way IMO.